Who ever said veggies have to be booooooring?? This VEGAN Poutine proves all the vegetable critics wrong. Crispy baked fries are topped off with a creamy and tangy cheese sauce and rich mushroom gravy. Made with lots of greens for good measure! When I was testing this Vegan Poutine recipe, I was wondering if Canada is the only country that eats fries with cheese and gravy!? But Back to this GREEN Vegan Poutine. I have to say this Green Vegan Poutine is pretty darn tasty. Like we’ve made this time and time again tastaayy. If you told me before I was vegan that you could make Poutine with dried mushrooms, cashews, and kale I might I have looked at you like you had a third eye (lol), but each ingredient in this Vegan Poutine is critical for its yumminess. And the best part about Vegan Poutine is that it’s made without ANY of the grease or heaviness that goes into traditional Poutine. So you won’t wake up feeling grosse the next day after eating it at 3 am! 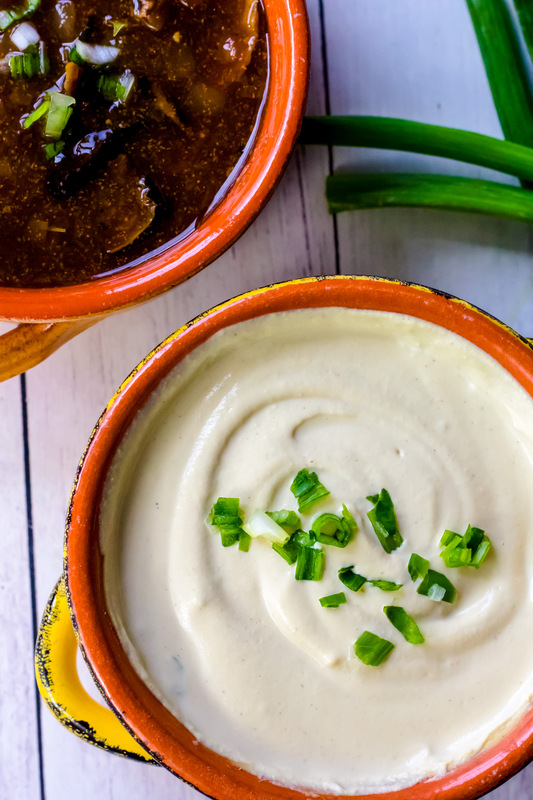 Cashews are what make the vegan cheese sauce soooo incredibly creamy and rich. Soak your cashews overnight or in hot water for half an hour so they are silky smooth when blended. Potatoes, particularly russet potatoes, are super starchy and perfect for making crispy, golden brown baked fries. Dried Mushrooms are the main ingredient in my Vegan Gravy. They create a rich gravy with so much depth of flavour. Kale…. it wouldn’t be a proper Vegan Poutine without sautéed greens. The cheese sauce + kale + gravy make for the perfect Vegan Poutine! If you make this Green Vegan Poutine at home, snap a photo and tag me #CearasKitchen on Instagram or leave your feedback in the comments below. I love hearing your feedback! Crispy baked fries are topped off with a creamy and tangy cheese sauce and rich mushroom gravy. This Vegan poutine is made with lots of greens for good measure! 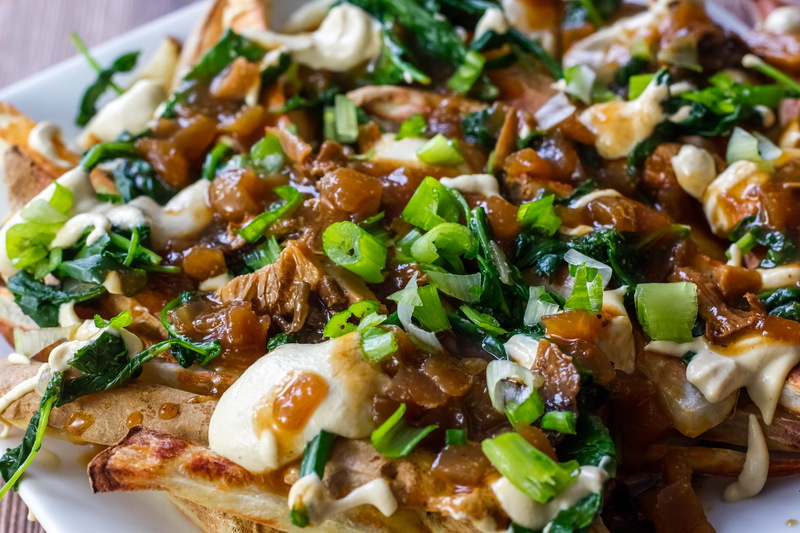 Don’t let all the steps involved in making this Vegan Poutine scare you off. The cheese sauce, gravy and kale are made while the fries are baking in the oven. 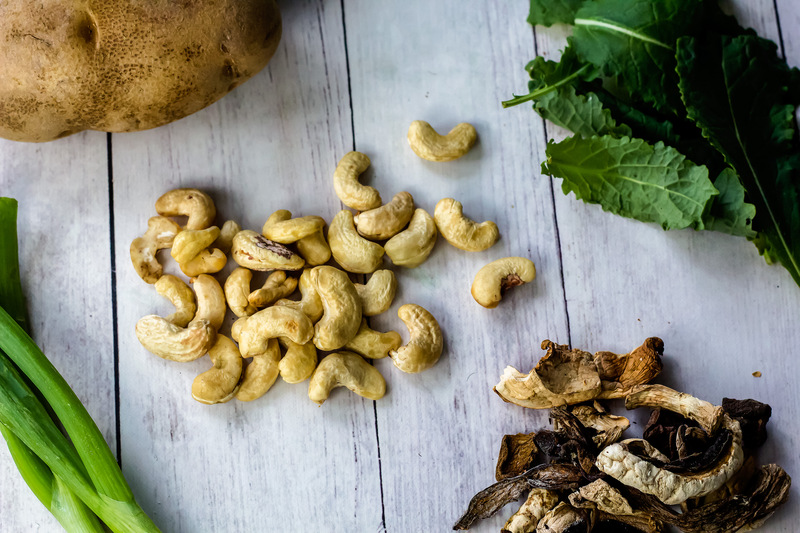 Soak the cashews in a large bowl covered with hot water. Soak dried mushrooms in 3 cups of hot water. Leave to soak for thirty minutes. Wash and scrub potatoes. Remove any rough or hard bits from the potatoes. Cut the potatoes in half lengthwise. Cut each potato half into four slices. Place the sliced potatoes in the water to keep them from browning. 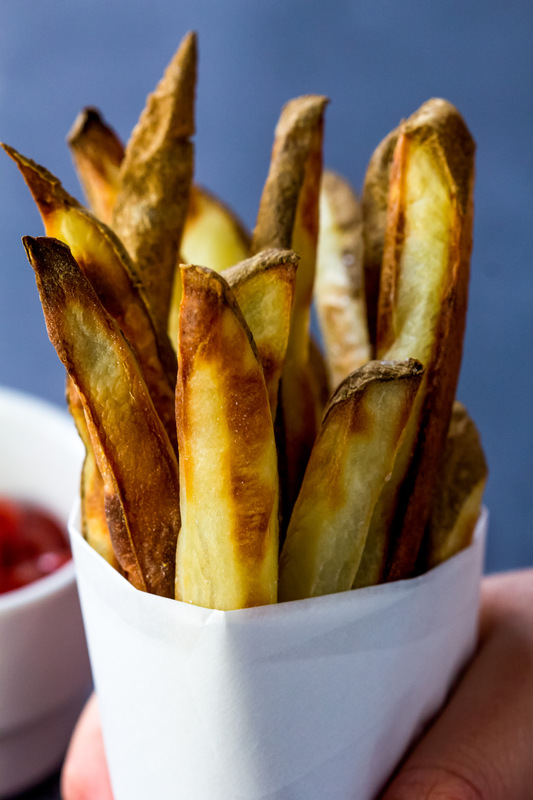 Using a clean dish towel or paper towels, dry the fries off fully before placing them on the baking sheet. Arrange the fries in a single layer on a pizza stone, stone baking sheet (the stone will make sure the potatoes get extra crispy), or baking sheet lined with parchment paper. Make sure the fries are about ¼ inch (1/2 cm) apart on the baking sheet. If the fries are too close, they will steam and not get as crispy. Sprinkle the fries with sea salt. Bake for 25 – 30 minutes until the fries are crispy and golden brown. Flip the fries halfway through to ensure even baking. Toss with additional sea salt when the fries are fresh out of the oven. Repeat in batches until all the fries are baked. Make the cheese sauce while the fries are baking. Rinse the cashews and add to a high speed blender with the rest of the cheese sauce ingredients (tofu through to nutritional yeast). Add ¼ cup water. Blend until silky smooth (you may have to stop the blender and scrape down the sides once or twice). Add extra water by the tablespoon, if necessary. Taste test and add additional herbs, salt, or pepper to taste. After preparing the cheese sauce, prepare the vegan gravy while the fries are baking. In a small pot, saute onion over medium high heat in a splash of water until translucent for 3 to 5 minutes. Add red wine and and simmer until the wine has reduced to ⅓ of its original volume (if using balsamic reduction, just add to the pot). Add onion powder, thyme and garlic salt. Stir. To thicken the gravy, in a small bowl mix corn starch with 4 tbsp of COLD water to create a thin paste. Rapidly whisking the gravy, add the cornstarch paste to the pot. Turn heat down to medium low and simmer gravy for another 10 minutes. The gravy will begin to thicken and will continue to thicken after you remove it from the heat. Taste and season with additional sea salt, pepper or garlic salt. Saute onion and garlic powder with a dash of water in a pan over medium-high heat. Add kale. Saute for 1 minute until the kale is lightly sauteed. Add a large handful of the fries to a plate. Top off with kale, a drizzle of the cheese sauce, and add a scoop of gravy. Garnish with green onions. Enjoy! 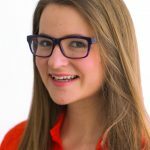 [b]Nut Free Version[/b]: If you need this Vegan Poutine to be nut free, use my [url href=”https://www.cearaskitchen.com/vegan-cheese-sauce-nutfree/” target=”_blank”]Nut Free Cheese Sauce[/url] in this recipe instead of the cheese sauce here. 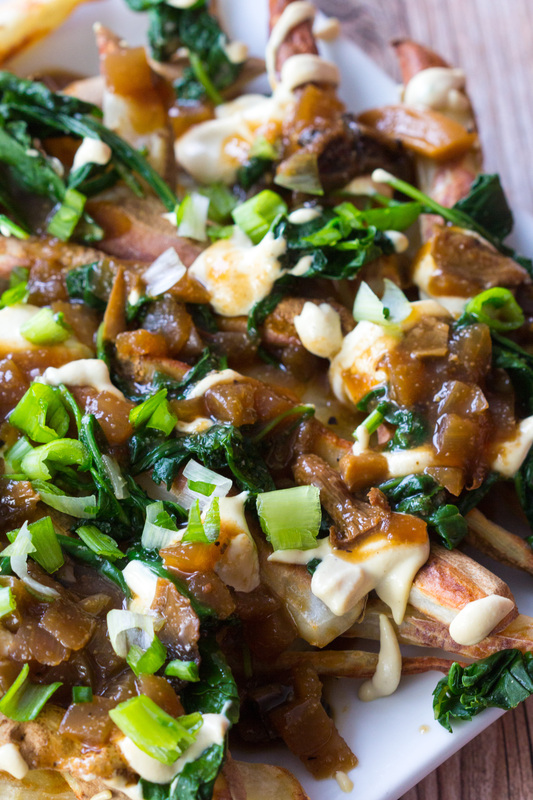 Will be making these on Saturday for dinner (don’t have to be Canadian to love poutine, eh?). Can’t find how many servings this is for—I’d say at least 4, right? Where do you find dried mushrooms? Or should I ask how you dry them? I found mine at Costco, but you can find them at most bulk food stores. Poutine definitely isn’t something I ever felt like I was “missing out” on as it looked SO disgusting. BUT, your version looks like something that I actually want! Love the pops of freshness and that it is such a healthy indulgence! I’ve never had fries with gravy, but it sounds like the perfect thing to put on a potato! I need to try this soon. You always come up with something really cool – this is no exception. I would love a big plate of this right now. Never had this before, but I did grow up eating gravy on my fries in Canada. Thanks for including the nut-free option too! Can’t wait to try. Thanks, Nicole! Hope you enjoy the recipe! I have never had poutine, but I am liking the look of this for sure!! Cheese sauce AND gravy – don’t mind if I do!! Haha! It really does make such a delicious combo! Thanks, Jenn! Here in New Jersey we have something similar that’s served in diners called Disco Fries. I love the addition of greens to your recipe! 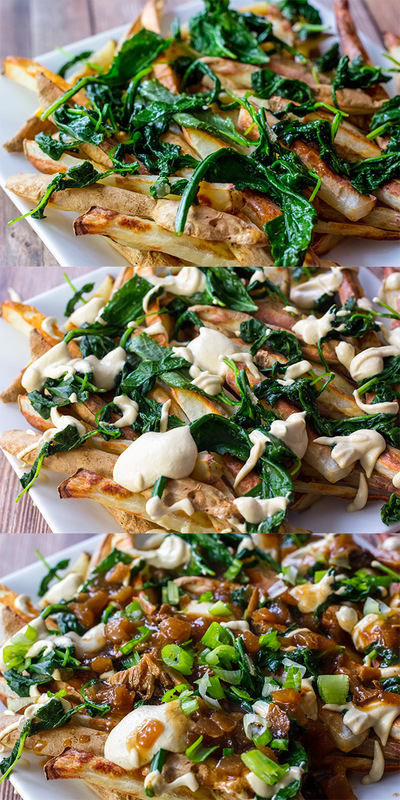 This is the third time I’m hearing about Disco Fries since sharing this recipe! They sound delish! This looks so good! Loving the green twist.